Goodbye, Greenhouse Gases…Hello, Tyndall Gases! Tyndall’s imaginative and inquisitive mind ranged far, especially into the chemistry of gases. His study that compared “optically pure” air to regular air found that food remained fresh in the pure air, reinforcing Louis Pasteur’s work on the growth of microorganisms. He studied the flow of glaciers and became an avid mountaineer (there are two mountains and a glacier named after him). He invented the fireman’s respirator and the light pipe (which later led to the development of fiber optics). But Tyndall is best known for being the person who proved the greenhouse effect of the atmosphere. Climate change is quite complicated for the layman to understand. The matter is made worse by the use of a term, the “greenhouse effect”, that refers to a physical system quite unlike the climate system. Communication is not well served by the use of a term that means something different from what it seems to mean. I propose that the term “greenhouse gases” be avoided entirely, since such gases are either not found in a greenhouse in special abundance or do not serve to warm the greenhouse to an appreciable extent. 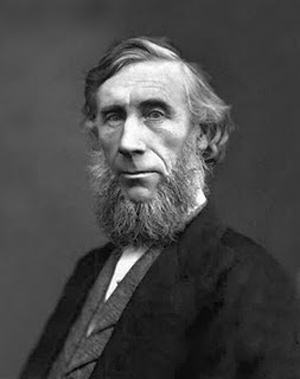 Instead, with respect to the scientist, John Tyndall, who first demonstrated that many trace atmospheric gases have powerful infrared absorption properties and thus may play an important role in Earth’s climate, I propose that gases with strong infrared absorptive/emissive properties be dubbed “Tyndall gases”. We’ll let you attend the poster session to get the details on Nielsen-Gammon’s reasoning, but it sounds like an appropriate way to remember one of the founding fathers of climate science. Not only that, but it honors the fact that Tyndall was an impassioned advocate of science and scientists: clear communication was a specialty of his. He wrote numerous books and contributed articles to popular periodicals, but it was as an orator that he most persuasively brought science to the people. A newspaper of the day noted that “Professor Tyndall has succeeded not only in original investigation and in teaching science soundly and accurately, but in making it attractive. . . .When he lectures at the Royal Institution the theatre is crowded.” Tyndall was a gifted speaker who regularly gave talks to the general public and effectively explained abstruse scientific concepts. His 1874 Belfast Address famously championed scientific reasoning over religious or nonrational interpretations. To get to know Tyndall even better, check out the presentation on Tuesday (3:30 p.m., Room 335/336) by Richard Somerville of the Scripps Institution of Oceanography. He will explore Tyndall’s scientific career and his contributions to the atmospheric sciences. Somerville was on the scientific advisory committee of last year’s Tyndall Conference, which celebrated the 150th anniversary of Tyndall’s paper on the greenhouse effect.